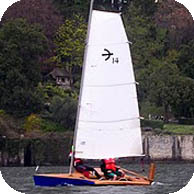 The Blitz420 sportive dinghy. The sleek lines and narrow hull makes it fast and fun, especially with weak and medium winds. The boat offers a great stability using the two outer wings, both as a springboard for the balance of the boat in navigation, and as additional buoyancy in the case where it touched the water in conditions of excessive heeling. Furthermore a hinge system allows to fold the wings inside the boat to limit the overall dimensions and facilitate transport. The hull, marine plywood, is achieved through the modern system “stitch and glue” that allows a quick and easy construction within the reach of the amateur builder also at the first experience.